In early modern times, warfare in Europe took on many diverse and overlapping forms. Our modern notions of ‘regular’ and ‘irregular’ warfare, of ‘major war’ and ‘small war’, have their roots in much greater diversity than such binary notions allow for. While insurgencies go back to time immemorial, they have become conceptually fused with ‘small wars’. This is a term first used to denote special operations, often carried out by military companies formed from special ethnic groups and then recruited into larger armies. In its Spanish form, guerrilla, the term ‘small war’ came to stand for an ideologically-motivated insurgency against the state authorities or occupying forces of another power. There is much overlap between the phenomena of irregular warfare in the sense of special operations alongside regular operations, and irregular warfare of insurgents against the regular forces of a state. This book demonstrates how long the two phenomena were in flux and fed on each other, from the raiding operations of the 16th century to the ‘small wars’ or special operations conducted by special units in the 19th century, which existed alongside and could merge with a popular insurgency. 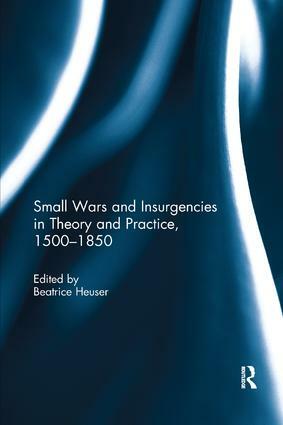 This book is based on a special issue of the journal Small Wars & Insurgencies. Beatrice Heuser is Chair in International Relations at the University of Reading, UK. Her research focuses on strategy, European security, transatlantic relations, Britain, France, USA, Germany, and defence policy making. She has published on nuclear strategy, Clausewitz, and the evolution of strategy since Antiquity.